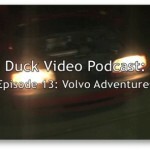 For those of you not already subscribed to the Duck Podcast, we just released a new episode this evening! Be sure to check it out at duck.jole.ca . And of course every week we try to improve the audio quality, this week it is really good! Hope everyone&apos;s having a good week!